A well presented two bedroom end of terrace family home, situated in a quiet cul-de-sac location and nestled within the heart of the desirable village of Copthorne. On entering the property, you are greeted with a fair sized hallway with space for a shoe rack and hanging coats, cupboard housing the gas and electric meters, laminate flooring and stairs rising to the first floor landing. Leading from the entrance hall the laminate flooring continues to the light and airy living room, with large bay window overlooking the front, an under stairs storage cupboard and open plan with the kitchen/dining room. The kitchen/diner overlooks the rear garden with patio doors leading to the sunny south east facing garden. The kitchen is fitted with a range of wall and base units, roll top work surfaces and a sink/drainer unit. Integrated appliances within the kitchen include electric oven and four ring gas hob. 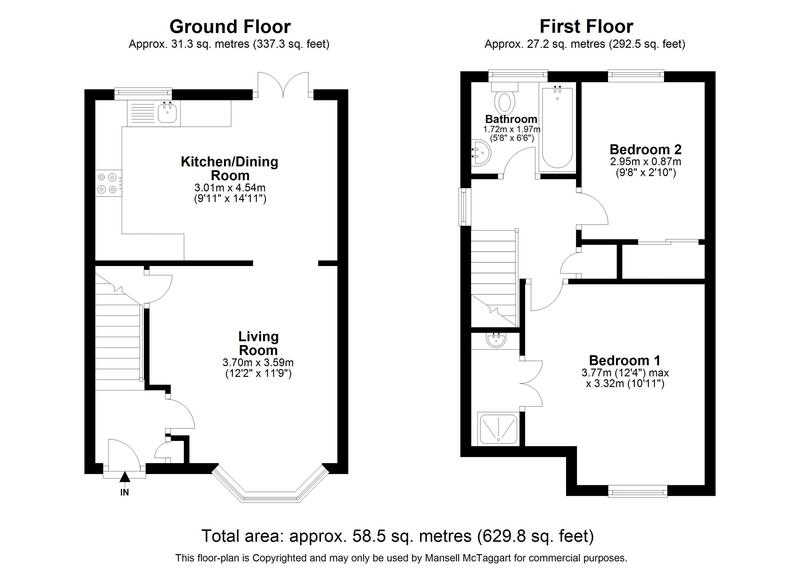 There is also space and plumbing for a washing machine and fridge/freezer. The kitchen also benefits from white tiled flooring. On the first floor landing there is access to a boarded loft with light and ladder. There is also an airing cupboard housing the hot water tank and additional shelving. The master bedroom is a good size double which overlooks the front and benefits from two large built-in double wardrobes as well as an en-suite shower room. The shower room is fitted with walk in shower cubicle, wash hand basin, vanity unit with mirror over. Bedroom two overlooks the rear and is fitted with a built-in double wardrobe. The family bathroom is fitted with a suite comprising of side paneled bath, wash hand basin and low level WC. Outside the property offers off road parking for one car to the front and another car to the side, a secluded sunny South facing rear garden. The private, low maintenance paved rear garden is enclosed with new wooden panelled fencing with secure gated rear access. Within the garden there is a wooden shed and attractive shrub borders.